Play on the beautiful BlitzIn board! Watch LIVE tournaments from around the world! Browse Current and past tournaments! Analyze with world famous Stockfish engine! Player photos and Country flags! 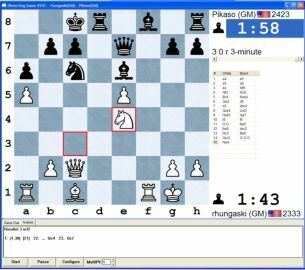 BlitzIn is a Windows program that shows you a chess board and lets you connect and play on the ICC. BlitzIn was the main Windows interface for ICC before Dasher and is still popular with many long-time members, especially those who prefer a command-line interface and are prepared to spend the time necessary to learn it. Unless you are already familiar with BlitzIn and prefer it, we highly recommend that you start with Dasher instead, which is easier for most new members to learn. Download the BlitzIn 3.12 installer. If you have problems with the new version, download BlitzIn 3.11 or older version here. Run the downloaded file. This will install BlitzIn on your computer. Connect to the Internet and run BlitzIn. The BlitzIn icon is the ICC logo. If you have not registered on the ICC, you can click the link by "Get a FREE trial of ICC!" to create an account. Otherwise, enter your ICC name and password, click the "Sign In" button. Once connected, the list of events is a fast way to access some of the most popular things to do at ICC. and install it. Then you can switch the language by selecting "Choose Language..." from the Options menu. The language pack will only work with 3.03, not with any previous versions of BlitzIn. Problems with the new version of BlitzIn? If you experience problems with a new version of BlitzIn, you can re-install an older version. Please be aware that you first need to change the piece set from "Smooth" to any other set before installing an older version. Your feedback is important! You can help us improve your interface by taking a moment and letting us know why you're downgrading and what we can do to improve. Please send your email to BlitzInBugs@chessclub.com.